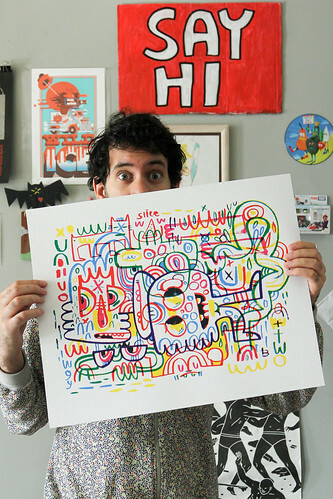 I recently interviewed Jon Burgerman, who made The Slice is Right, a limited edition print available exclusively through Random Number Multiples. Graphic from afar and slightly sinister up-close, The Slice is Right is a personal account of Burgerman’s experiences in New York City. 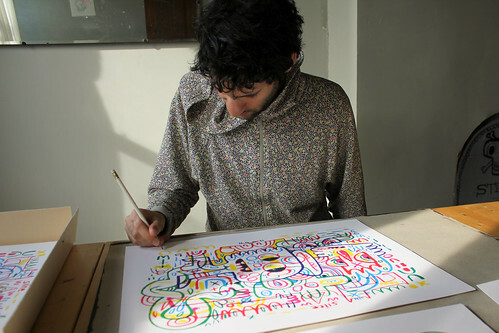 The interview and accompanying photos taken at his apartment/studio offer a glimpse into the life of this internationally recognized artist, illustrator, musician, and self-proclaimed salad enthusiast. CV: What are the first things that struck you about living in NYC? JB: It’s not really like visiting NYC; before it was a lark riding around on a packed subway and having to buy over priced groceries. Now when I do it I affect a pissed off demeanour, it’s trudgery and inconvenient. I think I started doing this just to blend in. Visiting anywhere is generally better than living in a place. Living involves responsibilities. I might make my next goal never to live anywhere, I’ll just visit for extended periods of time. CV: What about the art world here? Have you been pleasantly surprised, or maybe less pleasantly surprised, by its inner machinations? JB: There’s lots to see and lots to do which is fantastic. There’s lots of opportunities but less time to do anything, so that feeling of being disappointed in oneself looms larger. Like any place, most people seem to know each other, even in a big city it’s a small world. And people here are just as flakey as anywhere else. Promises promises, shhh shhhhh… only say you’re going to do something if you truly intend to do it! CV: Often times a change in studio or environment causes a change in artistic output. Are there any major differences now that your home and studio are the same place and in a new city? JB: When your beady eyes are glued to a glowing screen and little else, you could be sat anywhere, unfortunately. So on one hand little has changed. But going out, seeing new things, meeting new people, breathing new toxins and licking up different scents has had a big affect. My drawings and paintings are continuing to evolve and develop and I’m sure that is in part to my new environment. I plan to get a studio for painting in though. Part one of my plan to move to NYC involved finding a place to live. Now I’ve achieved that and know where the post office is, I can move on to part two; find a nice, bright studio space within walking distance from my flat. It’s a little isolating working from home and I think I’m missing out on meeting people by ‘going to work’ each day. CV: Your practice is super compartmentalized, with your commercial products residing at Burgerplex, a very active advertising practice, your band, and your body of fine artwork. Even so, everything you do is instantly recognizable within the Burgerman style, yet perfectly befitting its platform. How do you navigate these separate disciplines and maintain a cohesiveness in your work? Does this ever make you feel schizophrenic? JB: Hey, who isn’t schizophrenic?! It’s a balancing act, I have to juggle many things all at once. If I stop and think about it all too much I’d probably screw up and drop the balls. Does this analogy make sense? I believe in sticking to a truth, a sensibility that makes sense to you, of you, as a person and an artist. Some days I’m a painter, the next I’m in a band and the day after that I’m designing a collection of clothing, the constant is always me and how my brain ekes out thoughts. If I stick to that then the disparate elements of my fragile world will add up to a competent satisfying whole. CV: You refer to yourself as “lazy” in interviews. What the…? JB: I am terrible. I’m lazy and distracted. I’m woefully undisciplined. New York is great and awful. I’m surrounded by dead beats and failures, which is kind of great, at least for my wheezing ego, but then this city also attracts super talented artisans which only further confounds my self pitying failed expectations. I could do better. All my school reports said that, that I was lazy and too busy distracting myself and others. I think they were on to something. CV: How does participating in such an international scene (as opposed to a hyper local scene) affect your work? JB: I don’t know. People are sort of similar all over the world. I don’t know what, if any, scene I actually belong to. Like good old Groucho once said anyway, I don’t want to belong to a club that would have me as a member. Flux Factory’s Board of Directors is pleased to announce the appointment of Christina Vassallo as Executive Director. She succeeds Chen Tamir, who, after five years of involvement with Flux as a Curator and Executive Director, had a major impact on its artistic programming and greatly expanded its organizational capacity. 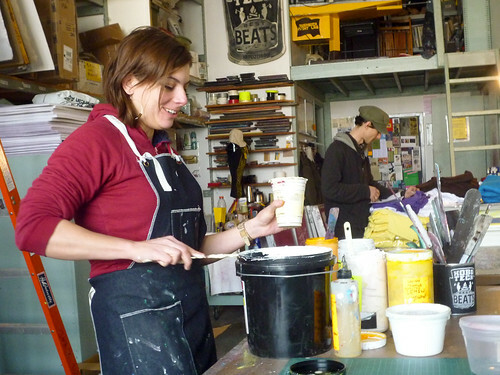 Christina Vassallo joined Flux Factory in January 2010. As Adjunct Curator she co-curated the most recent Flux exhibition, The Typhoon Continues and So Do You. She is spearhearding additional upcoming projects, including hosting a quarterly meet-up and curator’s support network, as well as an interlocking series of events that address key concepts of collaborative art-making practices (Congress of the Collectives). As Executive Director of Flux Factory, she plans to preserve the best of Flux Factory’s unique culture and mission while further define the organization’s relationship to the larger cultural landscape of New York City. By procuring resources for projects, arranging collaborations with other collectives and partnering organizations, and providing a welcoming context for seemingly impossible ideas, Vassallo hopes to expand Flux Factory’s profile as an incubator for the creation of new artworks. I will be wrapping up my curatorial residency at the Myrtle Avenue Brooklyn Partnership with a Myrtle Windows Gallery show. If you’ve ever walked down Myrtle Avenue during one of their shows, you’ll know that stumbling upon artwork in an unexpected place makes your walk a little nicer. Twelve artworks will be selected for display in shop windows along the avenue via an open call. See the call for proposals below, or click here. 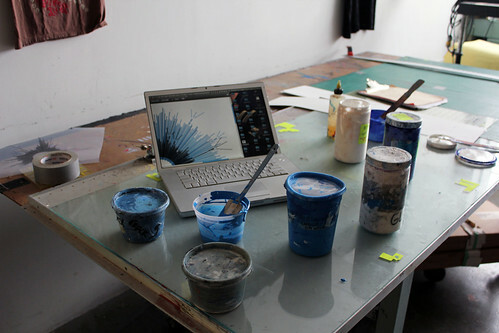 Earlier this month was quite messy, with a return to the Brooklyn Print Lab to make the next editions for Random Number Multiples. 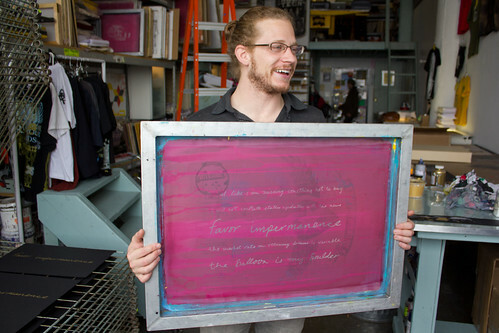 I joined Man Bartlett and Melissa Brown in the silk screening studio for the production of two new fantastic prints. Man’s is an archive of his 24 hour performances, and Melissa’s is a reversed print done on black paper with some beautiful color gradients. The new Random Number Multiples will be ready to order officially on May 12, but here is a sneak peek of our print lab hijinks in the meantime. After months of hard work, I’m happy to announce that Random Number Multiples is now up and running. The project is live and online with 2 data visualization silk screen prints by Jer Thorp and 2 abstract composition screen prints by Marius Watz. Periodically we will release new editions, and we already have new work in the making by Melissa Brown, Man Bartlett, and SOFTlab. Hope you like them!